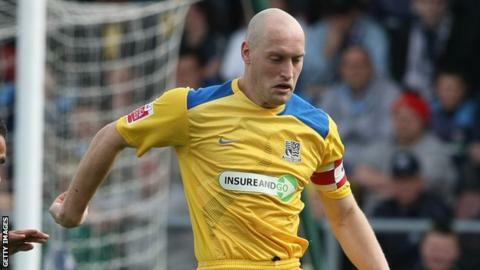 Southend defender Adam Barrett has admitted his future at the League Two club remains in doubt despite playing a key part in their promotion charge. The 35-year-old rejoined the Shrimpers in January until the end of summer, and has made nine appearances so far. "I have to sit down with the management and see what happens, but I have a lot to offer," he told BBC Essex. "I feel I'm proving out there I can still play, have a lot in the tank and if I was 25 no-one would question it." Barrett, who previously played for Southend between 2004 and 2010, made 289 appearances and scored 29 goals in his first spell with the club. And he believes that the character they showed during their 1-0 victory over Luton, despite being reduced to 10 men, will be the reason they will clinch promotion. Victory away to Morecambe on the final weekend with see them return to League One for the first time in five years. "Even when Ben (Coker) went off, I still fancied us to get a chance," he said. "It showed great character that we dug in with 10 men and we kept going and we fought for one another. "There is a great spirit and feel good factor coming back into the club which is fantastic and it is nice going into next week's game knowing that promotion is in our own hands."